The tweak the Yankees made to their rotation between rounds one and two — flip-flopping Andy Pettitte and Phil Hughes — meant that Hughes wouldn't be lined up to start a potential Game 7. But tonight he'll pitch a Game 6 that, with the season again on the line, is every bit as important. 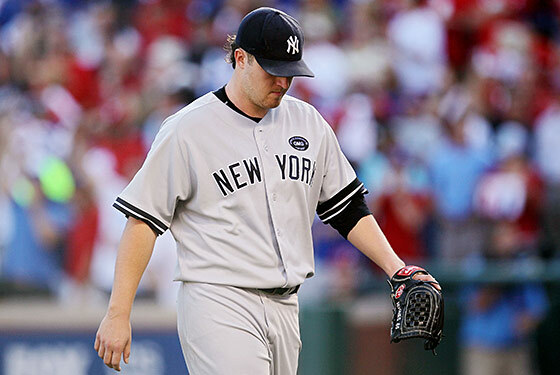 Hughes has some experience with this type of situation, sort of: He memorably pitched three and two-thirds innings in relief of Roger Clemens to earn the win in Game 3 of the 2007 ALDS with the Yankees facing elimination. But tonight he'll start the game himself, in the park where he hadn't surrendered a run until Saturday's Game 2. About that Game 2: Hughes struggled, for sure, allowing a steady drip of runs, each of which made a comeback like in Game 1 less and less likely. But the offense didn't help Hughes, who'd gotten such good run support all season: Against Colby Lewis (and five Rangers relievers), the Yankees stranded twelve base runners, and went just one-for-eleven with runners in scoring position. That slump would last for most of the first three games, of course, and the bats didn't really come alive until Wednesday's Game 5 — the first time the Yankees truly outplayed Texas for a full game all series. Remember that Hughes has, to this point, thrown the best single game of any Yankee starter in these playoffs: His seven innings of no-run, four-hit ball clinched the ALDS against the Twins. Of course, going by Bill James's Game Score metric, he's also thrown the worst, in Game 2 against Texas. Still, he showed against Minnesota that he's capable of throwing a gem, on a big stage, against a good team. (We'll continue to consider the Twins a "good team," however little evidence they present to support that each October.) And once again tonight, it's just about all hands on deck: Mariano Rivera is available for up to seven (!) outs, and Wednesday's starter, CC Sabathia, said he's available for up to 50 pitches. Drastic measures, indeed. At least one writer is looking for parallels between the Yankees' current situation and that of the 2004 Red Sox, although it's far from a perfect comparison, if only because the Yankees wouldn't have the luxury of facing Kevin Brown if they force a Game 7. (Nick Swisher, incidentally, would prefer not to talk about the man they would face.) One thing, however, that the 2010 ALCS could have in common with the 2004 ALCS is weather issues: Forecasts say that rain could be a factor this weekend, especially tomorrow. Of course, rain tomorrow means nothing without a Yankees win tonight. First pitch is at 8:07.